Three very clever and brave individuals at the Centers for Disease Control spent a grand total of $87 on a mass communication campaign that has so far generated over $3 million in free media coverage. These people and this project are exactly what I was talking about when I wrote my book, “Don’t Be Such a Scientist.” They have combined creativity with courage and now have validation — the latest of which is being selected as finalists for FIVE Platinum P.R. Awards (Blog, PR on a Shoestring, Word of Mouth/Viral, Wow, and Social Media Campaign). Truly amazing. Climate communicators please take note — THIS is how it’s done. 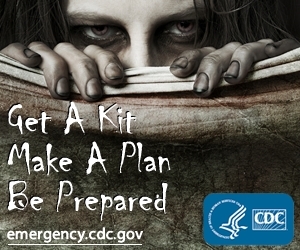 THE CDC ZOMBIE PREPAREDNESS CAMPAIGN: A textbook example of creative thinking and risk taking. People talk so much about “innovation.” This is a genuinely innovative effort involving smart, courageous people taking chances. HOW ARE YOU GOING TO GET PEOPLE INTERESTED IN THE RATHER DULL IDEA OF “PREPAREDNESS”? This is a mass communication success story if EVER there was one. I can’t say enough good things about this sequence of events — it shows how to overcome communications challenges. Once upon a time at the Centers for Disease Control in Atlanta there was this relatively dull topic that came up every year in advance of June 1, the start of hurricane season in the southeast, which was the challenge of motivating people to get prepared for potential disasters. The standard procedure was to take the LITERAL minded approach of having the CDC put out their annual reminder saying, “It’s about to be hurricane season again, here’s what you need to be thinking about,” usually accompanied by a photo of a hurricane (snore …). The Red Cross and lots of other organizations do similar things. Which is nice, but in today’s hyper-busy, social media-driven world, how many people are really paying attention — mostly only the people who are already interested in the topic. This is what you get with LITERAL minded media — very limited reach. So this year a few very cool people at CDC decided to try something different to AROUSE the interest of the public before attempting to FULFILL their presumed interest (as in the basic “arouse and fulfill” principle I discuss at length in my book). It started with Catherine Jamal in the Office of Communications at CDC telling Dave Daigle that she noticed a mention of the topic of zombies on Twitter in relation to the Japanese nuclear reactor disaster had generated a small blip of activity. Together they crafted a plan, just a month before the start of hurricane season, to try a little experiment — to see if the crazy topic of zombies might have any “arousal” potential for the information burden of disaster preparedness. Here’s the timeline of what they had planned, and how it actually played out. MONDAY – the “soft launch” as a short item is posted on the PUBLIC HEALTH MATTERS blog of CDC’s Director of Preparedness, Dr. Ali S. Khan. TUESDAY – all is quiet in terms of response until Tuesday evening when the wife of famous risk communication authority Dr. Peter Sandman sends an email to Dr. Tom Frieden, the Director of the ENTIRE Centers for Disease Control basically saying, “We just saw this blog post — what a great idea, you took a risk, it was innovative, it was worth it.” Dr. Frieden sends it to Dr. Khan, signaling from on top that the concept is on the right track, giving them the confidence for the full scale launch. WEDNESDAY – the more aggressive part of the campaign launches as they send out repeated items on Twitter and Facebook. By mid-morning there are over 30,000 views, CRASHING the CDC server. Then comes a phone call from FOX News literally asking them, “Which is it — were you hacked or is this a hoax?” (which says volumes about the buttoned down expectations of the public for CDC — “surely the government wouldn’t do something interesting, witty, and humorous”) By the end of the day the CDC Zombie story is trending on Twitter being Tweet at a rate of one per second, which will last for two days as the Wall Street Journal works on an article about it. Actually, that last line is sort of the overall message of this story. Dave Daigle said they did get a few negative comments from the public asking why government money was being wasted on zombie nonsense, but he and Dr. Khan took each one very seriously, taking the time to reply that only $87 was spent on the campaign and that the effort has produced the greatest interest in preparedness they’ve ever had. The actual quantification of how successful the campaign has been comes from Cision, a media analysis firm that CDC uses. They calculated what the dollar equivalent of all the media exposure generated would be, had CDC paid for it through advertising. Their estimate was well in excess of $3 million. In fact, the only previous comparable media effort by CDC was all the attention around the H1N1 virus, but that was something completely different, being generated by immediate public fear and concern. Well, yes. To be completely honest, things absolutely have gotten “this bad” that we need to utilize zombies as an arousal tool to engage the public, if that’s what it takes. And in general, that IS what it takes. What are the other options? That you somehow “stay the course,” remain an academic purist, and just keep spouting out the same literal-minded message year after year even though your numbers show that hardly anyone is listening? No, this is indeed the problem. And it’s a very serious problem. I keep citing Matt Nisbet’s report earlier this year showing that the climate community over the past decade has spent somewhere between a third of a BILLION dollars and a billion dollars on essentially attempting to communicate their message in an effort to get Congress to pass climate legislation. The entire effort has been a complete failure. No one is interested in what’s happening with the climate. The public is as bored with preparedness for climate change as they previously were bored with preparedness for hurricanes, earthquakes and floods. The difference is that some people at CDC got creative with disaster preparedness. Unfortunately the climate communication world has been sorely lacking in such efforts. We can only hope they will learn something from this amazing work by CDC, which by the way is a perfect demonstration of how to combat the very “Nerd Loop” that I railed against earlier this year on Andy Revkin’s NY Times blog. People talk about the need for “hope.” When it comes to these challenges in communication, the ONLY hope is that there will continue to be people who believe in the power of creativity and are willing to take even a few small chances. I sure hope the CDC team wins all FIVE of those Platinum P.R. Awards they have been nominated for. They are so completely deserving.